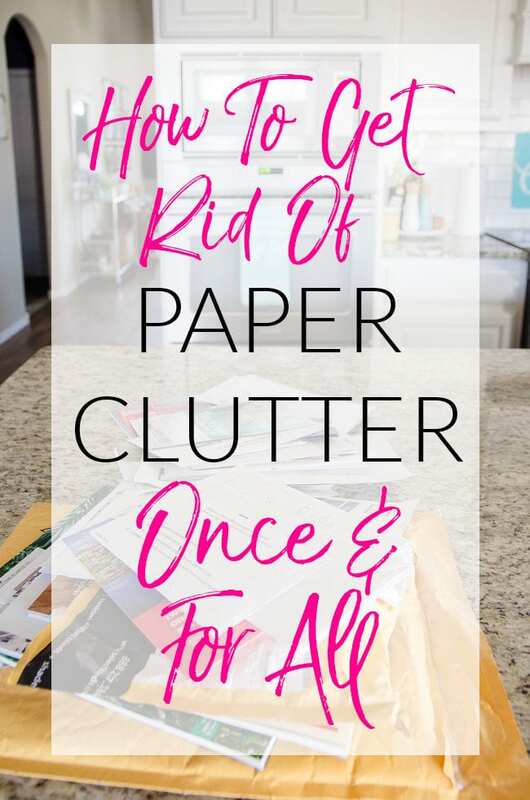 If you struggle with a countertop or table being overrun with paper and mail clutter, this is a must-read! Our kitchen island is the heart of our house – for family to gather and for STUFF to gather. It’s also one of the key spots that I have to keep clear to avoid a volcano of messiness from oozing out to the rest of the house. My makeup vanity can be a disaster with no adverse effects beyond that area, but once the island gets cluttered, suddenly dishes stay in the sink longer, dog hair stays on the floor longer, and anything coming into the house gets added to the pile. Which then grows beyond the island to the dining room table and any other open flat surface. Sound dramatic? I only wish I was exaggerating. The good news is that once you figure out the hot spots in your house, you can fix them! Incoming mail & paper clutter was one of our most significant challenges on the island. From what I’ve read, we’re far from the only ones that struggle with this. I’m kicking myself for not taking the few minutes it took to fix the problem sooner. 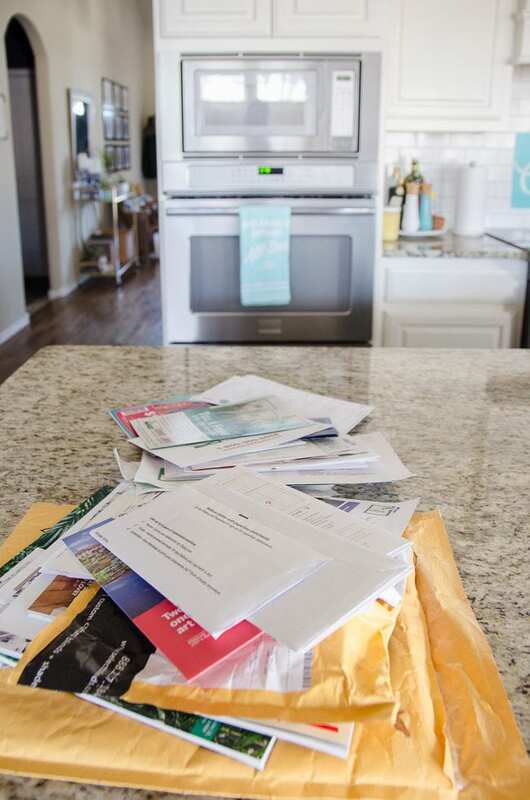 Totally staged photo of messy mail because I didn’t have any on the counter. The process is working! Actually, we did try to problem solve along the way. One method had a positive impact until it became a problem of its own. I put a box in a cabinet to collect everything that needed to be shredded. The first time it got full, I took it to a non-profit shredding center. But then I got a bit freaked out by the idea of that – how long does the stuff sit unshredded? What precautions are in place to make sure no one walks off with our documents? Sadly NOT a staged photo. That’s really what was behind door #1 when I opened it today. Dealing with the things to be shredded was only part of the problem. To fix our mail clutter situation once and for all, I listed out the categories of all incoming papers we had. Don’t skip this part! Since every house is different, you’ll want to make your own list, but here’s mine to get you started. The magazines were a bit of a side issue. They usually didn’t stay on the counter TOO long, but instead would end up someplace different every time. I never knew which ones I had read! Enough about problems, let’s move onto the fast solutions. Links below may be affiliate links, which means if you purchase after clicking the link I may get a small commission. The price you pay stays the same. The immediate trash/recyclables are my favorite category (if I block out that someone wasted a tree). Most days this stuff never even gets set down now, I put it right into the recycling. Once it leaves your hand to land on a flat surface, it could be there for weeks, so I avoid that whenever possible. The shredder situation was resolved when I finally spent the money on our own decent shredder. I picked up a micro-cut shredder at WalMart that seems like it’s somewhere between this one and this one on Amazon. I made a spot for the shredder in the office. 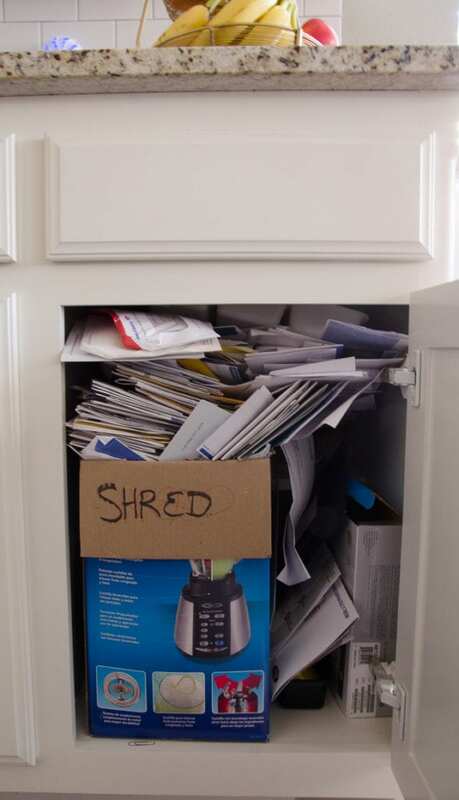 Things we don’t need (that have personal info on them) can get shredded as soon as the mail comes in the house. After trash and shredding, the pile I have left to deal with is much smaller. Conveniently, the shredder is right below our wall-mounted file organizer from IKEA. As an alternative, you can use a scanning system for this step and then shred the original. We just haven’t gone paperless yet. However, the “things to file” section of this paper decluttering process was my nemesis for a while. You see, like the secret shredding cabinet, I also had a drawer full of papers that had been shoved into one of the office drawers. The problem was that our actual files were also a disaster. We had the pretty wall files in the office, a fireproof file box that was so overstuffed it no longer closed all the way, rendering it NOT fireproof, and a large plastic file box containing who knows what. The wall files were super handy, but I never bothered labeling them with all the things we actually needed. And when there isn’t an appropriate file handy, papers end up in piles. Boo! I decided to take a pretty drastic, but necessary measure. Every file folder was pulled out of every filing location in the house. I couldn’t solidify a plan of attack until I really knew what we were dealing with. For example, did we need another fireproof file box or a safety deposit box (which is probably a good idea)? 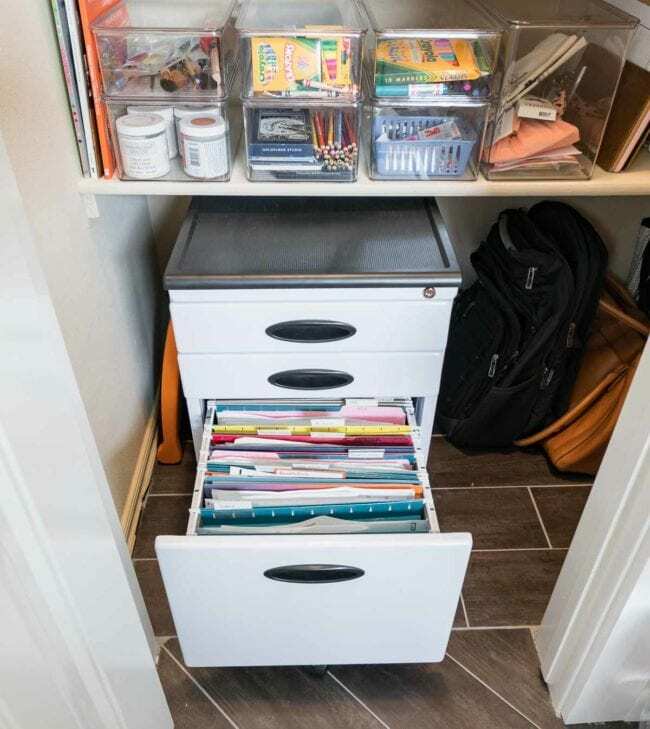 Depending on your storage available and file needs, you may be able to fit everything in one file cabinet, or you may need more of a tiered system like I created. 1. The fireproof box was designated for essential documents. Passports, titles, birth & marriage certificates, life insurance certificates, and the most recent 3 years of tax returns. Most audits happen in that timeline so we want to make sure all the documentation is protected. 2. Any old files we still needed to hang onto to, but that we won’t actively be adding to got archived into our plastic file box. The box includes things like tax returns from more than 3 years ago, paperwork for old houses with corresponding insurance documentation for them, and a few other old legal documents. The box can go in the back of a closet because it’s pretty much stuff you HOPE you’ll never need. The remaining files are things that we need access to either add papers or to reference. For most setups, you’ll have them all in one place, but I ended up using the existing wall files and a new single drawer file cabinet. 3. The right side wall file holds things that need to be accessed more frequently. Those retirement statements that come monthly? They go in the wall until the year-end statement comes. I also have a file for contact info for friends and family. 4. For everything else, I found a new file cabinet that would slide under the shelf in the closet. 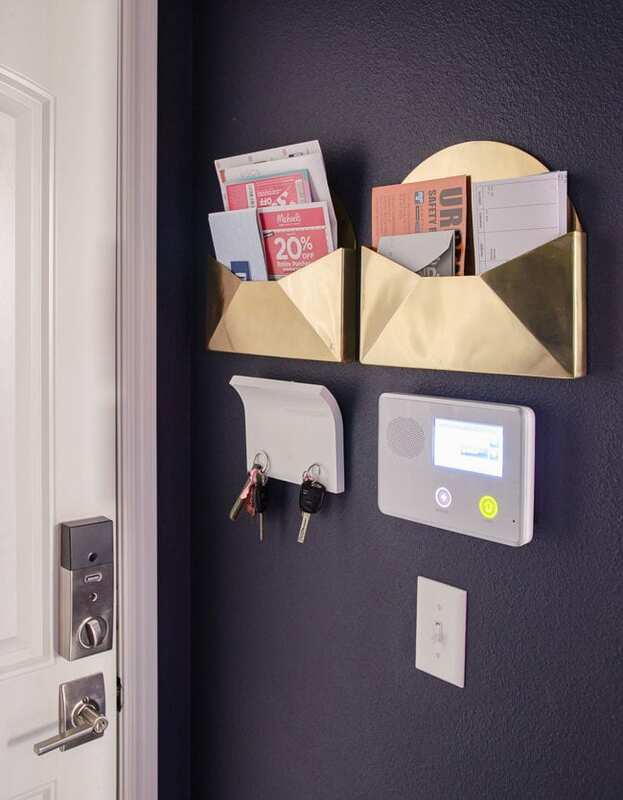 For our house, this means medical and dental files for each of us, a folder for each car, and warranty info and/or receipts for household purchases. You’ll notice the contents of the cabinet include a mix of different file folders. One day, I’d love to go through and color code everything, but sometimes you have to be okay with progress over perfection. It took about 4 hours straight to go through all my files WITH a helper. For our sanity, I needed to worry about the function first, and as long as something already had an existing folder, I just went with it instead of creating a “pretty” version. The important thing is that everything I could think of that routinely needs to be filed has a designated home now. And if I could get our file mess under control, I know you can do it too! If you have a home business, I recommend keeping business files separate from personal records. 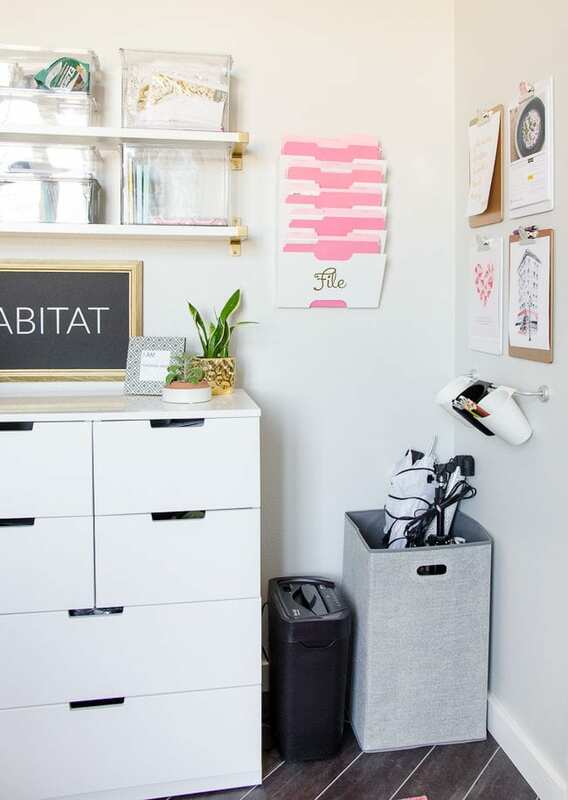 For Polished Habitat, I have a wall file and then use the file drawer in my desk for everything else. I made sure anything I need to reference sitting at my desk, like contracts, are in the desk file. After initially implementing our paper clutter control system, I realized we were still having a problem with receipts (both business and personal). When I thought through the why, I realized there were 2 issues. Business receipts that I didn’t want to put in the tax file until they were entered into the accounting system. Personal receipts that I did NOT need to keep long-term, but couldn’t throw away yet. For example, a Target receipt that I want to hold onto until I make sure nothing needs to be returned. The solution was so much easier than I expected. I designated two small bins in the office – one for personal and one for business. Neither should be a long-term storage solution, but more of a temporary drop zone. I’ll have to go through the business receipts weekly to account for them, so I’ll go through the personal receipt bin at the same time and either shred, file, or leave each receipt in the box if a possible return is still on the table. The receipt bins are labeled and on the bottom shelf, so it’s easy to drop them right in. And by catalogs, I’m only talking about the ones I REALLY want to look at for inspiration. Others may get a quick flip-through right away and then hit the recycling bin. 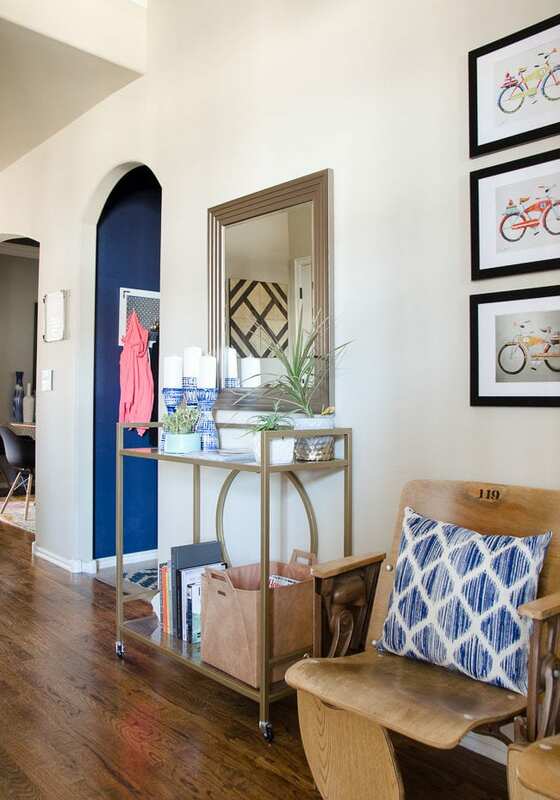 Last fall, I swapped the old console table in the entry with this bar cart. The lower shelf is the perfect spot for incoming magazines/catalogs that I want to look at. I found this faux leather bin at Target that has a vintage-look to hang out next to the auditorium seats. You can use any bin or basket that works for your house, as long as you have one dedicated spot. I’m excited to have all the new issues together to grab when I need a little break. After using this system for several months, I realized that there were certain magazines I wanted to hold onto for later inspiration. Recycle as many as you can right away, but then make sure you have a spot for the others to be stored where you can find them. I added some inexpensive paper magazine files to the office closet. It’s been awesome! I knocked a few items off my list by finding two wall-mounted containers that we mounted next to the garage door. One for things that require something from me, and one for things I might need again soon. The left-side gold envelope hangs onto store coupons I might use, things I might need to reference again (like invites after we’ve RSVPed), and weekly sales flyers for the grocery store we regularly use. The right-side is only for things that need some kind of action. Right now, there is a safety recall for Corey’s car, a card I need to mail, and a bill I need to pay. If there is some kind of financial statement we need to review together before filing, it goes here as well. The key to making this work is setting a reminder to go through BOTH wall-mounted containers once a week. It’ll give you a chance to DO everything in your Action Needed bin, and weed-out anything expired in your 2nd bin. If gold isn’t your thing, I found some clear wall pockets on Amazon that would be great for this too. 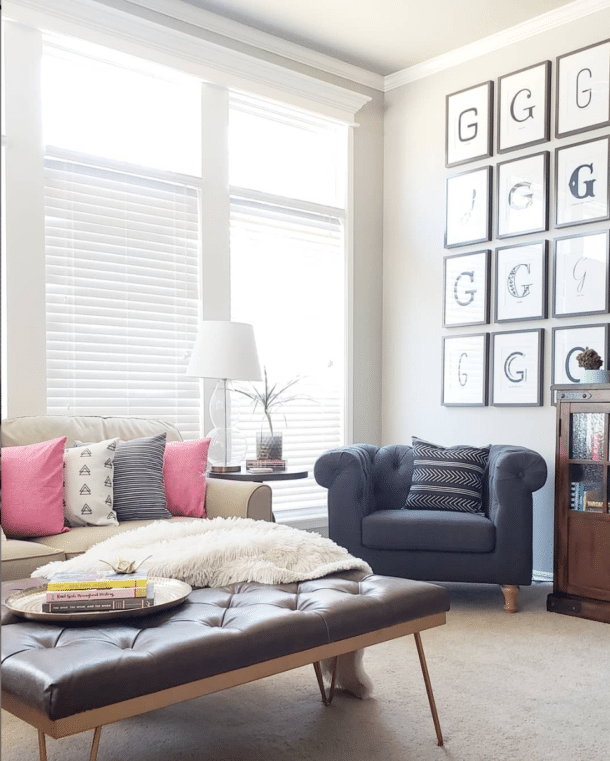 Don’t get stuck on the exact products I use, just the categories of things that linger around your house and how you can make it easier to handle them. The last group of paper items we needed a system for was sweet notes, cards or little mementos. When I cleaned out the office, I found them mixed into several areas, and I know there are more in my nightstand. Before they ended up any of those places, they always wandered around different flat surfaces for a good month. Now, we each have a photo box in the office closet that is stored with the top open on the top shelf. It’s SO easy to just drop in things that are worth saving. This turned into a long post, but setting up all the new systems was a speedy process. Make sure you’ve divided up each day’s mail to the right place before bed every night. If possible, do it right when the mail comes through the door. It takes 2 or 3 minutes max IF we stay on top of it daily. If you find that paper is starting to accumulate again, step back and do a quick evaluation of your system. What kinds of things are causing clutter now? It may take a couple rounds of trial and error to find your perfect system, but I promise it’s worth it. I’m kicking myself for waiting so long. Now that we have FINALLY dealt with all the different kinds of paper that end up on the island, I’m pretty excited to start the long-overdue process of shredding everything in that scary cabinet. I feel a shredding session with a glass of wine and Gilmore Girls coming on. 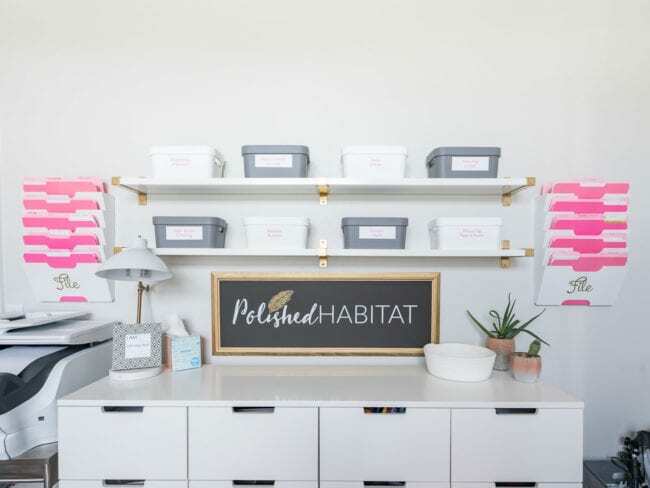 Let me know if you think any of these ideas will help your mail clutter situation in the comments below! Next up, check out my two methods for decluttering EVERYTHING – the quick microwave method, and the takes longer but tastes better oven method! Ha! I know what you mean about removing the mailbox, totally tempting some days! Is there a hidden camera in my kitchen somewhere? LOL This is seriously one one the worst clutter areas in my house!!! Thanks for the ideas. Getting the shredder in place now!! 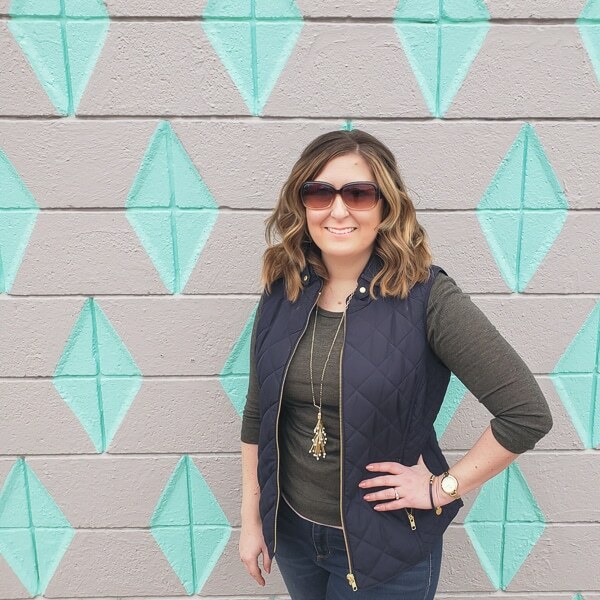 Love these Friday posts! Thanks Felicia! I don’t know if you’re this way, but when the kitchen is cluttered, it automatically makes us eat out more often too! The trickle effect is craziness. I hope going straight to the shredder helps you too! This is a constant problem at my house also. Papers everywhere! The kitchen counters/bar are a catch-all for everything. Lately I have had the problem of my desk and office looking like a tornado hit it because that’s where I moved it all for the holidays. That is my next big project. Ah yes, I’ve moved the mess before too. In fact, that’s where the all the mail in the staged before photo came from. I remembered that I had dumped some in one of the drawers in my office! I still have that mess to clean up, but I realized putting the system in place to “stop the bleeding” every day when the new mail comes has been way more effective than all the times I’ve tried to get through the backlog without having a system in place for the new stuff. I hope some of these ideas work for you! Well, I might have already said that my dining room table used to collect both mail and other things. Not just other things — EVERY thing. It was right at a pass-thru junction, foyer-kitchen-dining room-backhall (to bedrooms)- living room. Way too convenient to lay things down upon. I had an ah ha moment some years ago and I swapped the living room and dining room furniture so that the dining room table is not in a walkway anymore — it’s out in a bay, dead end. That made an amazing difference in our house clutter and mail problem! After that, mail collected on the breakfast table (somehow easier than the island a few feet away), making a mess and getting lost in the pile. (Not that I don’t have other island clutter.) We’re struggling still with the b’fast table clutter — it’s too easy to set down things that don’t have a home or need a decision! A lot of the worst mail problem was solved when we moved the location for “incoming mail pile” to a small table in the foyer. The surface is about 12″ square! Since it’s small, the initial sort of mail gets dealt with (by my husband, who brings it into the house) or it overflows. So far so good. –What can be recycled or shredded is. –Bills go to a separate processing stream for payment, which works. –Almost all catalogues go to the recycle bin — I know I can get them online. I’ve been trying this technique of breaking the problem down and finding solutions for each part. This is how far I’ve gotten. The few fliers / coupons go into a basket, and I do sort thru them at intervals. I’ve just instituted a new system for the coupons, before Christmas. I think it’s working, as a prototype. I suffer badly from “out of sight out of mind.” But I have a 9-lite glass door leading to my garage and when I was washing it up recently, a lightbulb hit. On the 3 rows of glass lites, I put a post-it label: “This Week,” “This Month,” and “This Quarter.” The coupons I want to use (like restaurants, stores) go in the appropriate category, tucked under the trim against the glass. So far, since I am passing thru the door lots, I actually do keep them decluttered at intervals. We can grab a coupon going out the door. The latest and best thing I have done (just in the last month ) is to use [so far 2] clear file folders and at least tuck the items into those by category. I can see them so it’s not out of mind. One is for financial stuff. Another for other todo’s — any little lists and the papers with info I accumulate on top of my desk each day. (I’m trying to cut down on this habit but I guess it’s just the way my mind works.) Today, I actually went thru both folders and dealt with what I could, limited by time. It’s the first time in my life my desktop itself has not gotten buried, accumulating too much stuff until I have to do a stash and dash. A few weeks and counting! This year, 2018, keeping my desktop and the surfaces in this house clean of paper clutter is on my goals list. Oh my goodness, you have made such huge progress through a series of steps and some trial and error! I truly think that is the best way to find a solution that works long term. Painful during the process, but so worth it in the end. Here’s to a paper clutter free 2018! Thanks, Ashley! Setting a repeating reminder has been my stop-gap measure to make sure I’ve got through it! What a timely article for me. 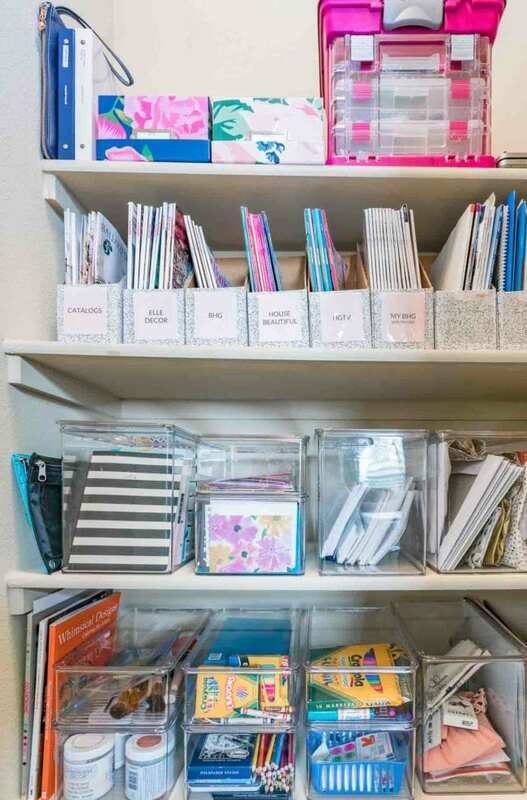 I am implementing all of your ideas to try to get the paper chaos under control, but was wondering what are the categories you use for your wall filing system? For the wall file, we have files for each car, each retirement/bank account, health care, other insurance and receipts for larger purchases. Tax receipts and documents go in a file in my desk for the current year, then get moved to a fire-resistant file box. The box also holds more important longer-term documents (titles, passports, life insurance policies). Everything could be in one place, but for me it’s easier to have the tax documents at the desk where I enter them into the computer since most are business related, and the wall file for anything else that we receive that needs to be kept. I like the wall file because I’m lazy and for some reason WAY more prone to immediately put something on the wall that doing the work it takes to open a file cabinet. 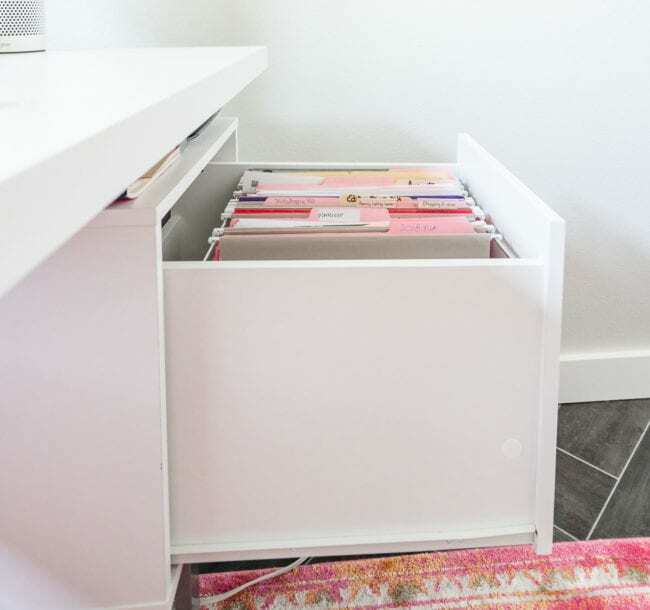 🙂 Oh, and I always keep a couple empty folders in the wall organizer as well so when something doesn’t have a folder, I can make it in seconds without trying to find an empty file folder. Thank you for the quick response. This gives me some ideas to build on for our personal situation. I managed to make a huge dent in the “dreaded office” today with your system. The new info will definitely help me to finish up the job. Yay! I’m so glad you’ve already made some good progress! Lots of good information here, but Its not hard to go paperless. All you need is a system, a way to scan (app or scanner), and storage (like Dropbox or Evernote free versions). I now have one drawer with only my important papers…birth certificate, social security card, deed to the house, tax documents, insurance contracts.. It takes about the same amount of time as physically filing papers (once you’re up and running) and when you need something, it’s easier to find. There’s tons of information on Pinterest about getting started. And we have no magazines either. If your library subscribes to RB Digital (formerly Zinio), you can check them out and read them on your tablet or computer. No expiration dates. 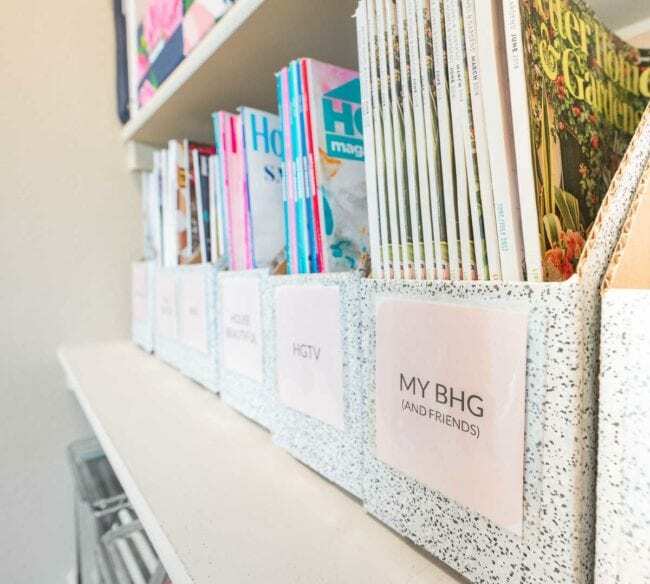 Our library gives me access to over 160 different current magazines, plus lots of back issues. I really miss magazines — real ones. I just had to stop almost all of them coming because we could not develop the routines to keep them moving out. I found myself hankering after some home/design or architecture magazines after reading this. Sigh. I go through phases of stopping the magazines for the same reason, but I absolutely LOVE the real ones in my hand. I get excited every time they show up in the mailbox! I do think checking for them at the library would be a good middle ground. Or keeping just 2 favorites coming. I finally admitted that I don’t go back through old ones very often at all, so I’m trying to be more realistic with recycling them sooner. I need to pick a spot a donate them so it turns into a win-win! Glad it was helpful, Crystal! By putting rattan baskets attached to cute fancy L brackets ( baskets -Target, L brackets at Lowe’s) and I secured them with zip ties. And they get dumped every Friday evening. So those that receive mail get to keep it till Friday night and then we start again. If we’re Gonna eat out that day. Picture of it. My interior designed friend said ooh I like that it looks built in!